Paul DeLongpre, a French artist who worked in Paris and New York before settling in Los Angeles in 1899, began painting flowers as a young child and by age twelve was earning a living painting them on fans. Watercolor was his primary medium. Flowers were popular in Victorian society, where specific blooms symbolized things like love and constancy. In America DeLongpre painted them on greeting cards and also as easel paintings. His style is what some would call “French” for while his subjects have botanical accuracy, their overall feeling is one of delicacy and lightness. Cactus Blossoms stands out from DeLongpre’s usual subject of cultivated flowers -- such as roses, which he grew in his own garden in Hollywood – because the plant, which may be a variety of Mammillaria, is native to southeastern California. Here he presents it at its most spectacular – during its once-a-year blooming. 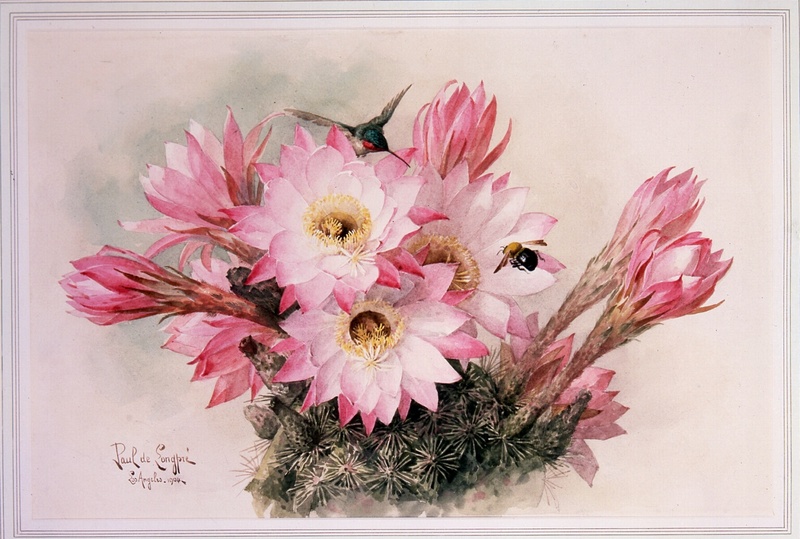 Although DeLongpre used all manner of compositions ranging from single sprigs against a white background, to cut flowers in vases and flowers strewn on tabletops, Cactus Blossoms is an example of his flowers growing in situ. Provenance: Armand DuVannes Gallery, LA, May 21, 1985, who purchased it from a Butterfield auction, 1984; exhibitions and publications: reproduced in color The Museum of California (Oakland Museum of California), v. 23, No. 2, Spring 1999, p. 8; exhibited California Watercolor: An Introduction, Antelope Valley College, Lancaster, Ca., April 4 - 28, 1988; exhibited With an Eye Toward Collecting California Paintings, Adamson-Duvannes Galleries, LA, September 28 – October 19, 1985, and reproduced in cat. in black and white p. 18.